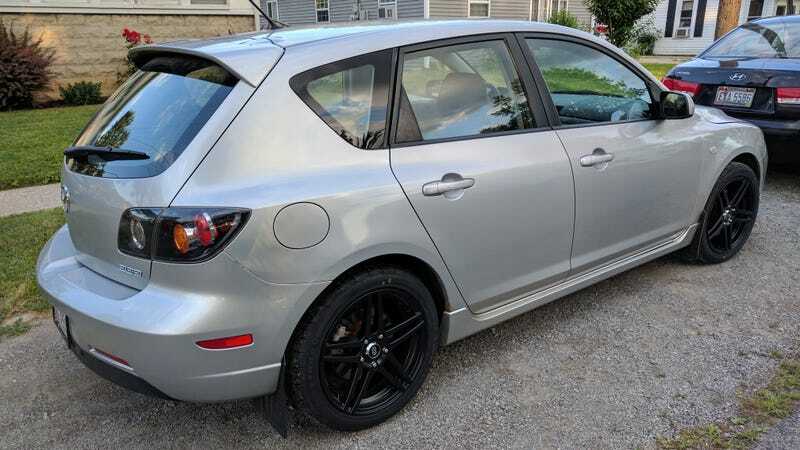 Been having a problem with my 06 Mazda3 for a while. The front end started shaking last Summer and I’ve been chasing the problem when time and money allowed since then. ETA: Yes, I have hub centric rings on the new wheels. This was a problem when I was still running the stock wheels (Winter steelies match the stock hub bore). The front of the car shakes at speed. What that speed is varies. Sometimes the shake shows up around 25 mph, sometimes it isn’t noticeable until 60 mph. It’s not violent, but it’s rarely subtle. Steering wheel wobble. Like bad force-feedback throwing a gaming wheel back and forth. Frequency always builds with speed, but it doesn’t always start at the same speed. Sometimes it’s subtle at 25 mph and builds from there. Other times it absent until 55 mph and builds from there. Vibration. The whole dash vibrates. Not visibly, but tangibly if I touch it. It does vibrate my dash-mounted phone visibly, though. Noise. Not a great description, but more like a soft thud than a scraping noise. Frequency and volume increase with speed. Again, none of this is violent, but it isn’t subtle. When the shake showed up initially, I was running Cooper Xeon RS3-S summer tires. Many of the reviews I read before I bought them said that as they wear they tend to go out of balance more quickly than most tires. By the time the shake showed up I was already 10K miles into the tires and on the wear bars, so I figured I’d just wait to replace them instead of bothering with getting them rebalanced. As it was well into Autumn by that time and I was broke, I just swapped on my Blizzaks/steelies from the previous season and hoped that would solve the issue. While it seemed to at first, it didn’t take long for me to realize the shake was still there, though perhaps somehow muted by the heavier wheels and thicker sidewalls (205/55/16 on steel vs 205/50/17 on aluminum). By the end of Winter, the front of the car shook violently when braking at highway speeds and I had nowhere to work on it, so I took it to a local shop. They quoted me way too much for four cheap rotors to replace my warped ones, but I payed them to do the work because I just wanted my car back. That smoothed out the brakes, but not the shake that probably caused my wacked out rotors in the first place. Even though I explained to them that I had been through two sets of wheels/tires which had both been rotated at least once and the shake never changed, they insisted that my problem was out of balance wheels and tried to sell me new tires to smooth everything out. I passed on that and decided to stick it out until I could afford my recent wheel upgrade to go along with new summer tires. As expected, despite brand new wheels and tires that were Hunter Road Force Balanced™ at the warehouse, the shake persists. Beyond that, my brand new brakes have developed a persistent squeak that keeps time with the shake and when the brakes are applied there’s a rhythmic grinding noise that shows up from around 10 mph down to a stop. That may or may not be related to the fact that the shop reused my old brake pads “because they have a lot of life in them”. My thought is that something is obviously not right in the front suspension. Whether it’s a bearing, bushing, or ball joint, something is loose and causing both the NVH issues and the funky brake wear. That said, I’m not really sure where to start. I gave up halfway through replacing a ball joint once and that’s the extent on my experience with suspension work. What should I do, fellow Opponaughts? In case you’re unfamiliar, my 3 has McPherson strut suspension up front, multi-link in the rear, and disc brakes all round.